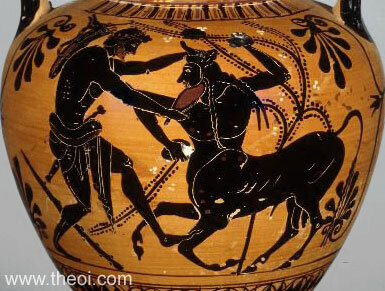 Heracles wrestles the river-god Achelous, grasping him by horn and beard. The deity is depicted as a centaur-like creature with the lower body of a bull. He wields a pair of stones and is surrounded by the coiling branches of a small tree. The hero has a bow and quiver strapped to his back and a sword scabbarded at the waist. A knotted club lies by his feet.